Quite a number of years ago I was at a get-together of outdoor photographers and the question was floated -” what is your favourite month for landscape photography”? I suggested August because, after the “green deserts” that are June and July, the landscape seems to come alive mid-month with the first signs of autumn. And the nights are long enough again to get a decent nights sleep…….. My choice was greeted with – well, not exactly snorts of derision – but less than an enthusiastic response. I couldn’t help suspecting that some of the others present had not actually noticed the changes that take place. This year has been a little different. The heat and drought of July led to a very parched looking landscape, even in Wales – some might say looking more like summer! Since then there has been plenty of rain and greens have come back to the fore. Come mid-August and I’m not quite sure what to make of it. What is difficult not to notice, for the third August in a row (at least), is the lack of bright sunshine. Here in west Wales the passing of a cold front usually leads to crisp, clear atmospheric conditions which are excellent for the photographer. For the last few weeks all that has followed seems to be a different layer of cloud. A ridge of high pressure? More cloud. Perhaps my photographic colleagues were thinking of typical August weather rather than the way the landscape actually looks; and perhaps in that sense they were actually correct. Maybe August normally is a pretty hopeless month for photographing the landscape. All has not been lost, however. Cloudy conditions can be excellent for certain subject matter, where bright sun introduces high levels of contrast. In woodland, for example, deep shadows and bright highlights make photography very difficult. For very different reasons other subject matter demands what I call “honest light”. Industrial landscapes, for example, where you do not wish to introduce any of the glamour or warmth that sunshine might bring. Both of these situations came together for me one day last week. As part of the “Darganfod Dyfi” (Discovering the Dyfi) commission that I am working on, I followed one of the projected circular walks above Corris as far as a deserted slate quarrying village, now being engulfed by trees. 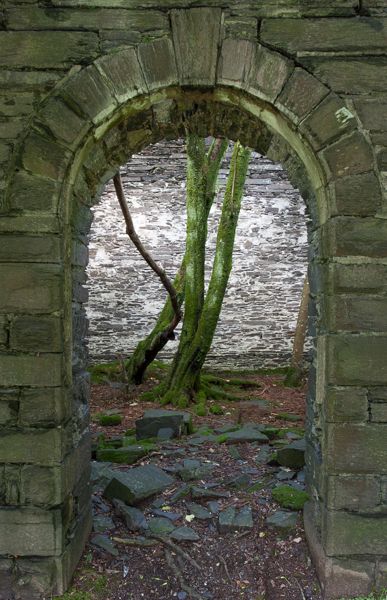 The whole place would repay further exploration, but right by the path was a tiny chapel, without door, roof or windows. Working for other people on their projects can be rather soul-destroying. It often involves subjects and locations that one would not normally bother with . But occasionally you come across something exciting that you would never have otherwise found, and this was one example. It was tricky to position the camera correctly to give a perfectly symmetrical image, and I don’t think I quite succeeded, despite also using the lens correction tools in Lightroom.. But after a period of time when photography had become rather uninspiring for me, the chapel felt like a gift.